Mexican Mauricio Mendez whoop it up at the finish line after he outran the stellar opposition heading home to annex the coveted men’s crown of the Regent Aguila Ironman 70.3 Asia Pacific Championships yesterday at Shangri-La’s Mactan Resort and Spa in Lapu-Lapu City. 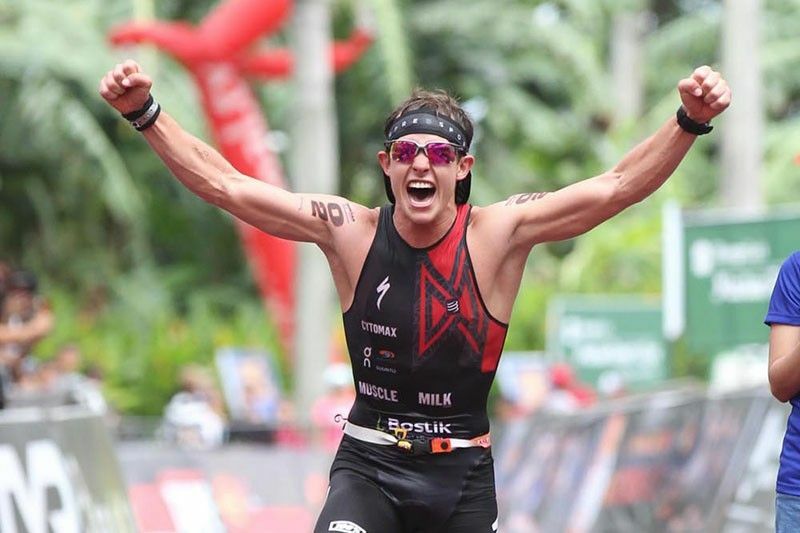 CEBU, Philippines — Mexican Mauricio Mendez and Czech Radka Kahlefeldt scored their biggest triumphs yet after besting the world-cast field in the Regent Aguila Ironman 70.3 Asia Pacific Championships on a relatively cool Sunday at Shangri-La’s Mactan Resort and Spa in Lapu-Lapu City. Four months after ruling the inaugural Ironman 70.3 in Davao, the 22-year-old Mendez dished out another performance-to-remember as he outran the stellar opposition heading home to annex the coveted AsPac men’s crown before screaming fans. Mendez checked in at 3:46.45 to outclass Bermuda’s Tyler Butterfield (3:47.39), Braden Currie (3:48.12) and multi-titled Aussies Tim Reed (3:52.51) and Craig Alexander (3:54.09) in the grueling 1.9k swim, 90k bike-21k run event. Kahlefeldt, who also won in Davao three months after the birth of her first child, sustained her top form and crowned herself the queen of half-Ironman in this part of world to the delight of a cheering crowd led by her husband Brad and seven-month-old daughter Ruby. She covered the distance in 4:12.13 – over eight minutes clear of Swiss Caroline Steffen, who bucked a tire puncture to clock a second-best 4:21.50, and 2017 winner Mel Hauschildt, who settled for bronze with 4:22.50. Cebu-based Banjo Norte also grabbed the spotlight in the $75,000 event put up by title sponsor Aguila Energy Drink and Regent Food Corp. and produced and organized by Sunrise Events, Inc. as he topped the men’s Asian Elite category with a time of 4:24:34. Alexandra Ganzon reigned in the distaff side in 5:04.52. “It’s the biggest win of my 70.3 career, so I’m super happy,” said Mendez, a former XTERRA world champion. Running seventh after the 90K bike, Mendez cranked it up in the footrace and blew by pacesetter Butterfield by the 16th kilometer mark on Punta Engano road, initially seizing a 22-second upperhand. He kept his feet on the pedal the rest of the way and went on to win it by 54 seconds. “This is unexpected; I prepared myself to win but I don’t know, everyone is super strong here and prepared, too. I’m really happy to take the win and I want to keep myself going in the sport,” said the Mexican, dedicating this to his family, especially his late uncle, who died in a car crash two years ago. Kahlefeldt also made her big move in the culminating run. Trailing Lauren Brandon by 12 seconds after the ride, Kahlefeldt virtually flew out her bike and transitioned into run, keeping a blistering pace that left her pursuers struggling to keep up and zooming to a seven-minute gap en route to her most shining victory to date. “Winning the championship is amazing but winning it in such a strong field made it even better,” said Kahlefeldt, who got some love from her hubby and baby after crossing the finish line. American Lauren Goss was actually the second to breast the tape at 4:20.12 but she was later disqualified due to her failure to serve penalty for a blocking violation committed in the first lap of bike.